An island paradise in the South China sea. Pulau Perhentian, Malaysia. Perhentian Island is getting popularity in recent years. Every year, thousands of tourists from all around the world flock to this island to seek for a sweet escape from the noise and bustle of urban city. 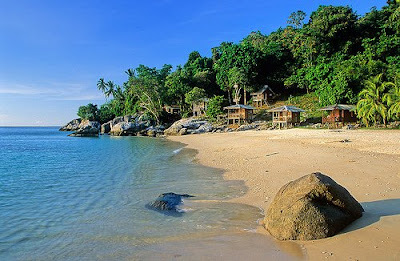 The island is located in Terengganu, one of the states in Malaysia that has beautiful and attractive beaches. This island is located at the northeastern coast of Terengganu, approximately 21 km off shore of Kuala Besut, which is the main town. In order to reach the island, you will have to take a boat from Kuala Besut jetty. You can opt to go for a speed boat or a normal boat where the journey to the island take about 40 minutes or 1 and a half hour respectively. Boat services can be arranged through local agent at the jetty or booked in advanced by tour agent. Tokong Laut, arguably one of the best dive sites in Perhentian Island, has a lot of very cooperative pufferfish that makes really good models. It will be more convenient to take an express coach as the bus will stop at Kuala Besut jetty and you can hop on to the boat immediately. However, for those who take a flight, transportation will not be a major problem. Once arrived at the airport, you can take a taxi from Kota Bahru town in order to reach Kuala Besut jetty. Also known as “Stop by Island” in Malay language, it got its name centuries ago as ships from China will stop by the island before sailing to other South East Asia countries for trading purposes. It is also a place where the ships will stop by before sailing to Kuala Terengganu to trade salt. Overall, Perhentian Island can be divided into two, Pulau Perhentian Besar and the Pulau Perhentian Kecil. Both islands are adjacent to each other and accessible via speed boats. 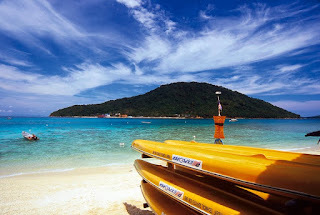 Pulau Perhentian Besar is a more “happening” island as most of the resorts and lodge are located here while Pulau Perhentian Kecil is more suitable for those who would like to have a serene and secluded vacation without doing much. There are several types of resorts, from budget to luxury type located in both islands where visitors will be spoiled for various choices. Some of the famous resorts in Pulau Perhentian Besar are Flora Bay Resort, Arwana Perhentian Eco Resort & Beach Chalet and Coral View Island Resort. On the other side, Bubu Long Beach which is located at Pasir Panjang in Pulau Perhentian Kecil is the most renowned and recommended. Though numerous resorts are available in both islands, it is advisable to make room reservation in advanced as rooms can be fully booked during the peak season. The peak season is from March to August. 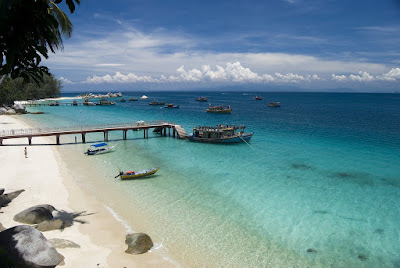 Perhentian Island is indeed a paradise for tourist to experience the real relaxation and rejuvenation. Along the long stretch of white sandy beach, plenty of hammocks hang between swaying trees. Lying on the hammock to get a perfect sun tan where breathtaking sea view, symphony-like sound of waves and gentle warm breeze accompany you by your side will definitely make you feel like a paradise on earth! Snorkeling and scuba diving sessions are the activities not to be missed on this island as thousands of incredible sea creatures await your discovery. The sapphire blue like water will amaze people with its clarity. Just a simple step of putting on the goggle, you will be astonished by what you see under the crystal clear water – corals in shades of pink, red or green and colourful fishes swimming and chasing against each other. Further to the deeper area of sea, you might be able to see giant turtle if you are fortunate enough. However, you are reminded to swim as “gentle” as you can in order to minimize any possible noise that could frighten the hypersensitive turtle because once the turtle notices something approaching, it swims away. Believe it or not, turtle is a good swimmer and once you missed it, you might not be able to chase it anymore. Shark is also another interesting creature under the water. You need not worry on whether the shark will attack you (as what we usually see in the movie!) because it usually attacks only when it feels being threatened. You can tell that sharks will appear in a particular area when the temperature of sea water changes from cold to warm. When you experience this, this is a signal that that sharks might be around. 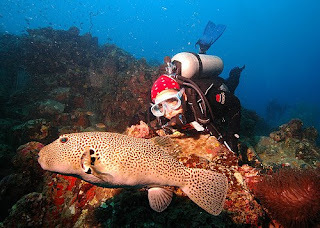 There are several diving and snorkeling spots around Pulau Perhentian. A few to be named are Tiga Beruang, Teluk Pauh, Batu Butuk and Tanjung Tukas. It is advisable to get an experienced tour guide in bringing you to all the famous diving and snorkeling spots around the island. Scuba diving and snorkeling activities can be made available through advanced booking from the tour agent. You can also make a request with the person-in-charge in the resort that you are staying in as there will always be guides and professional divers available.